Ther. Sunday, Jan. 29, 1888 Wea. Thawing some. Cloudy all day, much same with our folks, & Rosa with Clyde out to Band of Hope meeting A.M. George & Clyde at s_ school P.M. all spent eve at home. 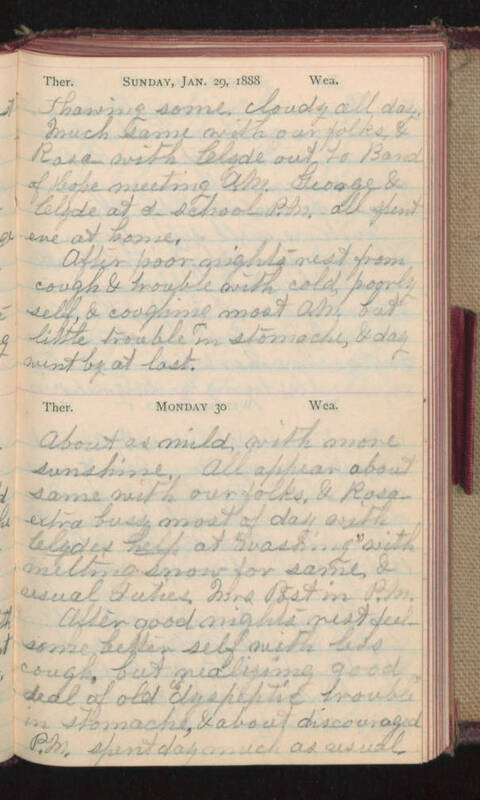 After poor nights rest from cough & trouble with cold, poorly self, & coughing most A.M. but little trouble in stomache, & day went by at last. Ther. Monday 30 Wea. About as mild with more sunshine. All appear about same with our folks, & Rosa extra busy most of day with Clydes help at "washing" with melting snow for same, & usual duties. Mrs. Post in P.M. After good nights rest feel some better self with less cough, but realizing good deal of old "dyspeptic trouble" in stomach & about discouraged P.M. spent day much as usual.